These words were printed everywhere! Huge banners announced the welcoming spirit. Small signs in store fronts reassured the masses they were encouraged to step in and enjoy their hospitality. Not just one town but multiple communities rolling out the welcome mat for this gathering of motorcycle enthusiasts. Since I was a very small child I had heard about Sturgis. The good, bad and the ugly of it. The assemblage of bikers coming together to celebrate their passion for the open road. I had never had an opportunity to participate, never a bike to ride let alone a bike to drive. I love the feeling of freedom while on a motorcycle. The flash of speed, the whipping of wind on your skin, the beauty of a well designed bike, the rumble of power, all these things lead to a mysterious lifestyle, that I have never known. My travels took me into the Black Hills of South Dakota last week. The breath taking beauty of the region was reason enough to desire a twisting road trip. Arriving a full week before the advertised dates of, what has now become Rally, I thought I might see the preparation stages of the community. I was not prepared for the multitude of motorcycle riders I was lucky enough to drive with. 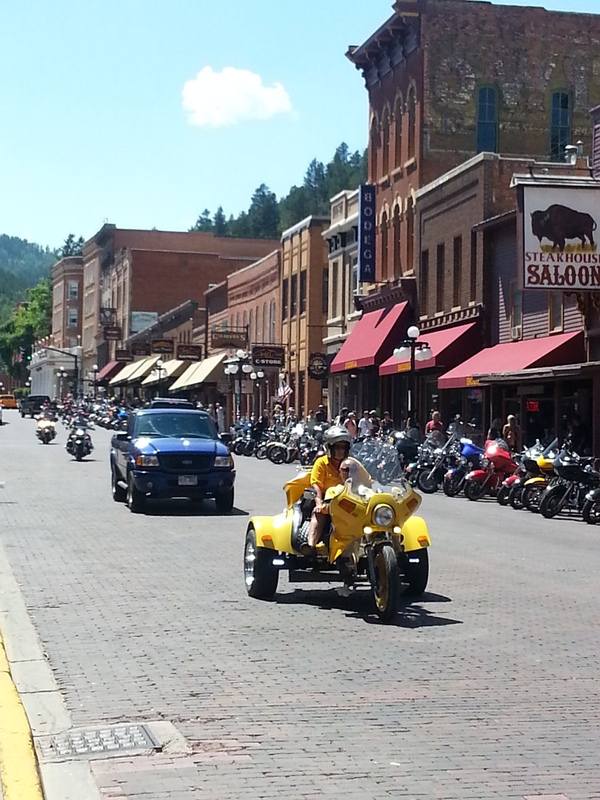 Not only has the event grown so large that it invades Sturgis South Dakota but it reaches to Deadwood, Lead, Spearfish, Hot Springs, Rapid City and beyond. Events large and small in continuous motion starting before dawn and lasting well into the night. It was a sight to behold. Beauty of design intermingled with art and innovation, creating two and three wheeled modes of transportation. The amount of pride owners feel towards their bikes is second to none. Returning home I thought of all the excitement I would be missing in the Black Hills this week. Talking about my travels with anyone who would listen I was on a “travel high”. Then social media erupted Monday night with the tragic loss of a motorcycle enthusiast. Not in a far away area, but right here in our community. A young woman was lost to this world in a horrible accident. She was a bright light to so many, an avid rider, with a zest for life. A vigil was organized to honor her and rally support for each other in our grief. As we lit candles, tears were shed, hugs were given and thoughts of our loss flowed freely. Rally around each other in celebration of our humanity. Rider or not we are all here, on this planet, together. Stay safe on the road at home and away.